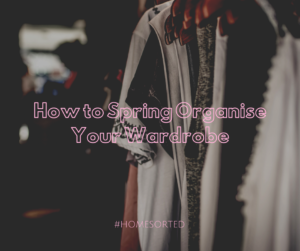 How to Spring Organise Your Wardrobe - Home Sorted! Spring! It’s the perfect time of the year to spend an afternoon getting sorted for the warmer weather. Don’t you agree? Of course, you do. Now, before you dive head first into a pile of clothes, we recommend you read our tips below! Spring organising your wardrobe will not be a quick task. Ensure you set aside enough time to thoroughly get the job done. We recommend a minimum of two or three hours. Before the fun can begin, you need to remove all clothes, shoes, bags and accessories from your wardrobe. Since you’ll be organising in your bedroom, we recommend placing items across your bed. Next up is the culling phase of spring organising. Get yourself two big garbage bags – one for charity, one for trash – and a positive attitude. As you sort through your clothes, shoes, bags and accessories move items that you don’t wear into one of the two garbage bags. The same goes for clothes that are ill fitting, not your style, or are being held onto for sentimental reasons. If you’re tech savvy you can consider a third garbage bag for items to sell online. Once you’ve culled your clothing pile, it’s time to move everything back into your wardrobe. We recommend organising your clothing (in both the hanging space and drawers) by type. For instance, coats, dresses, pants, tops, etc. Start at one end of the wardrobe and work your way across to the other in the following order: coats, dresses, skirts, pants, and tops. Keeping like items together will also reduce the time spent getting ready of a morning. Remember to consider your shoes when spring organising! We love placing a shoe rack at the bottom of the wardrobe to maximise space. You can also use hanging shoe storage if your wardrobe doesn’t accommodate a rack. Another space saver is hanging bags (or scarves and jewellery) on hooks inside your wardrobe doors. Just remember to check that the doors still close with everything in place. Is this the nudge you need to finally spring organise your wardrobe? We sure hope so! Good luck and happy sorting!